Banana Bread Muffins Topped with Pecans. Delicious! I love banana bread, it’s such an easy way to use overripe bananas and tastes amazing! It’s also not as rich as a chocolate cake, making it the perfect dessert when you want just a little something sweet. The only problem with banana bread is how long it takes to bake. Problem solved: turn your banana bread into banana bread muffins instead! These banana bread muffins taste exactly like the classic loaf, just in a small size! It’s great not having to have a knife and cutting through the loaf each time. Just grab a muffin and go! 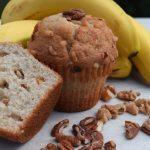 Banana bread muffins make an awesome on the go snack or an add-on to your morning breakfast. Give these a try. They take 3/4’s of the cook time of a whole loaf of banana bread. Love banana bread? Check out these banana bread recipes. Why make a whole loaf of banana bread when you can make single serve banana bread muffins? Classic banana bread in half the time! In a medium bowl, cream the eggs, vanilla, and sugar. Add in the bananas and mash them at the same time using your hand mixer or fork for more banana chunks. In a small bowl, add the flour, salt, and baking soda. Give it a mix. Start adding the dry ingredients to the wet ingredients 1/3 a time. You can use a spatula here, no need to over mix. You can also fold in the nuts here or simply top the cupcakes with a little bit once you've filled the cupcake liners. Once the batter is complete, start filling your cupcake liners about 3/4 way, leaving room for the cupcakes to rise. Bake in the oven for 15 minutes, checking at 10 minutes to see how they're doing. You can also test them with a toothpick.